The ARM architecture changed significantly with the introduction of the ARM6 series. The section below describes the differences in behaviour of more recent ARM processors, used with RISC OS 3.5 and later. For details of earlier ARM processors, see the chapter entitled ARM Hardware. The PSR had to be separated from the PC into its own register, the CPSR (Current Program Status Register). The PSR can no longer be saved with the PC when changing processor modes; instead, each privileged mode now has an extra register - the SPSR (Saved Program Status Register) - to hold the previous mode's PSR. Instructions have been added to use these new status registers. Undefined instructions, aborts, and supervisor code no longer have to share the same mode. This has removed restrictions on Supervisor mode programs which existed on earlier ARMs. 26 bit program and data space. 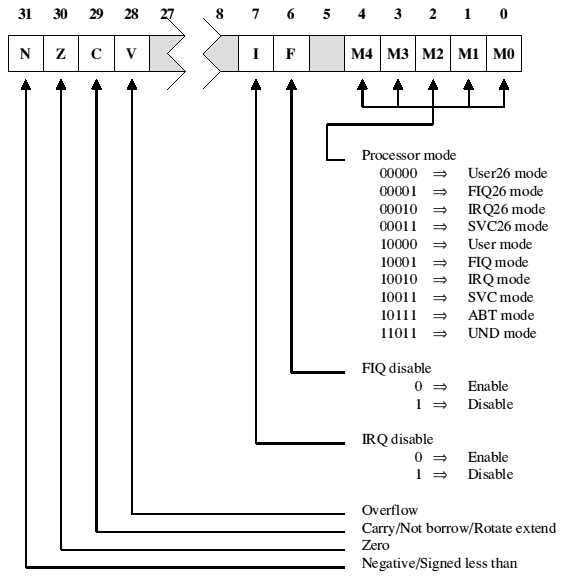 This configuration forces ARM to operate with a 26 bit address space. In this configuration only the four 26 bit modes are available (see Processor modes below); it is impossible to select a 32 bit mode. 26 bit program space and 32 bit data space. This is the same as the 26 bit program and data space configuration, except that address exceptions are disabled to allow data transfer operations to access the full 32 bit address space. 32 bit program and data space. This configuration extends the address space to 32 bits, and introduces major changes to the programmer's model. In this configuration you can select any of the 26 bit and the 32 bit processor modes (see Processor modes below). Undefined mode (abbreviated to UND mode): entered when an undefined instruction is executed. The distinction between processor modes and configurations is important, and will be rigidly adhered to in the rest of this manual. Address exceptions are only generated by ARM when it is configured for 26 bit program and data space. The new instructions to transfer data between general registers and the program status registers remain operative. The new instructions can be used by the operating system to return to a 32 bit mode after calling a binary containing code written for a 26 bit ARM. When in a 32 bit program and data space configuration, all exceptions (including Undefined Instruction and Software Interrupt) return the processor to a 32 bit mode, so the operating system must be modified to handle them. If the processor attempts to write to a location between &0 and &1F inclusive (i.e. the exception vectors), hardware prevents the write operation and generates a data abort. This allows the operating system to intercept all changes to the exception vectors and redirect the vector to some veneer code. The veneer code should place the processor in a 26 bit mode before calling the 26 bit exception handler. In all other respects, when operating in a 26 bit mode the ARM behaves as like a 26 bit ARM. (See the chapter entitled ARM Hardware.) The relevant bits of the CPSR appear to be incorporated back into R15 to form the PC/PSR with the I and F bits in bits 27 and 26. The instruction set behaves like that of the ARM2aS macrocell, with the addition of the MRS and MSR instructions. 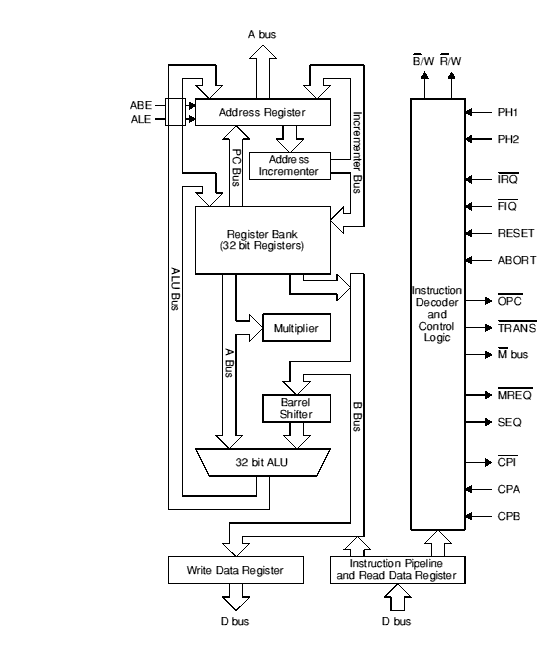 Early in its startup code, RISC OS writes to the ARM's control register to change it into the 32 bit program and data space configuration, where it remains. You must not alter the processor's configuration yourself when writing code for RISC OS. Although RISC OS runs under a 32 bit configuration, it remains in 26 bit modes for normal operation, providing a high degree of backward compatibility with code written to run on earlier 26 bit processors. However, because the processor is in a 32 bit configuration, all exceptions (including Undefined Instruction and Software Interrupt) force the processor to a privileged 32 bit mode appropriate to the exception. There are therefore some differences in exception handling between 26 and 32 bit architecture ARM chips, although RISC OS provides a considerable degree of backward compatibility by faking 26 bit behaviour on 32 bit architecture chips in most circumstances. For full details, see the chapter entitled Hardware vectors. there are two new privileged modes, each of which has private copies of R13 and R14. The allocation of the bits within the CPSR (and the SPSR registers to which it is saved) is shown below.